We had a whirlwind trip to Lucban, Quezon last May 14-15. I say whirlwind because it was unplanned and decisions were made to go only 2 days before the trip with the number of participants only confirmed on the actual day of the trip itself. It was a good thing that for once, I wasn't the organizer or else the stress would do me in. Lol. The day of the trip arrived and we all agreed to meet up in the JAC Liner terminal at Buendia. My friend couldn't get us a place in Lucban town proper because of the festival so she decided to get us rooms in Lucena instead, about an hour from Lucban. That's why the bus we took had the signboard for Lucena. I was pleasantly surprised to know that the JAC Liner bus had free wifi onboard so to pass the time, I surfed for other places of interest near Lucban. I figured if we were going there anyway, might as well see all there is to see. We left the terminal at around 7am. Fare to Lucena costs P250. However, I read that there was an interesting old house in Sariaya so after 3 hours of traveling, we got off at the town of Sariaya. Unfortunately. the house we planned to visit, the Governor Natalio Enriquez ancestral house near the church, was only open to the public if you had an appointment. Oops. We didn't know that. Happens when you only do a 10-minute research via your mobile phone on the bus. Lol. So we opted to do a visita iglesia instead and walked to the nearby church of Sariaya, the St. Francis of Assisi Church. This church houses the miraculous Santissimo Cristo de Burgos, a huge image of the crucified Jesus Christ. After the Church visit, we walked a short distance to a bakery to try Sariaya's pinagong, a kind of hard, rather tasteless bread native to the area. It wasn't spectacular but I found it very filling. Our next plan of action was to take a jeep going to the next town, Tayabas. Our destination was the Minor Basilica of St. Michael the Archangel. When we got there, a mass was being held and there were a lot of people because the town was also celebrating its fiesta. To pass the time until the mass ended and also because it was raining and we couldn't continue traveling until the rain stopped, we visited the church's museum where we were given a tour by one of the lay people. The museum contained old church paraphernalia like Christ's image made of ivory, monstrances made of silver, old church bells, a cross made of solid stone and a replica of the Pieta. Sadly, photos weren't allowed to be taken inside the museum for fear of theft. The museum also had vestments worn by bishops and cardinals, pictures of the church from way back when, and old handwritten ledgers. 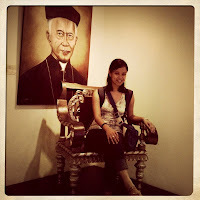 One interesting bit about the museum was a "wishing chair" of Blessed Bishop Obviar said to grant the wish of whoever sat on it. Of course, we each took turns making a wish. After the museum tour, we went back to the church to take photos now that the mass had ended. To be honest, this church was one of the most beautiful churches in the Philippines that I had seen, interior-wise. According to my research, this basilica is the longest Spanish colonial church in the country. From the outside, it is shaped like a key with the altar forming it's handle and the long aisle forming the neck. Currently, the church is asking for donations to do a restoration of the structure. We read a publication citing the areas that need fixing like peeling paint, leaking roofs, scrambled electrical wirings, to name a few. The electrical wirings nearly caused the church to burn down sometime in the past. I really hope it would not come to that. After our photoshoot, we were treated to pancit at the church's canteen because one of my friends met an acquaintance of her father's who worked at the church. 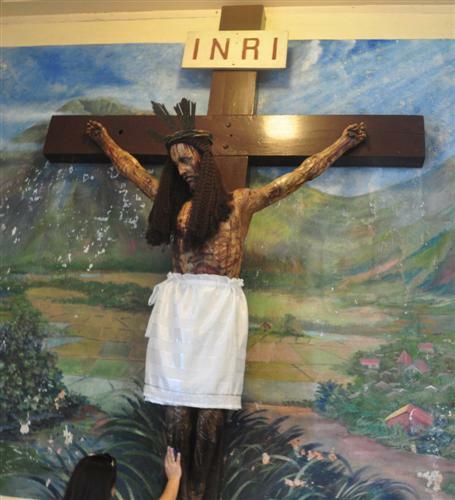 Another proof of the Filipino people's hospitality. Our next stop was the town proper of Lucban where the Pahiyas festival was to be held. We decided to skip going to Lucena but head straight for Lucban. The fiesta wasn't until tomorrow but we knew there was a parade in the town. That's what I'll talk about in the next post.